In today’s software industry, collaborative software development is the key to drive innovation, achieve profitable growth and increase efficiency. Collaboration is required because Software Delivery is spreading across departmental, geographic and corporate boundaries thereby leading to a proliferation of disparate tools, processes, and cloud usage. Team Foundation Server (TFS) automates the Software Delivery process and enables you to manage the software development projects throughout the application lifecycle. It provides the commensurate communication and collaboration that you need to ensure that your software gets built fast and gets built right. 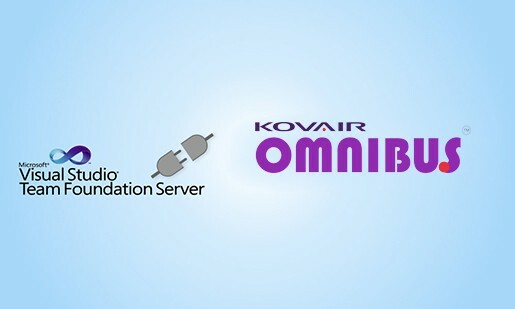 ‘Kovair TFS Integration Adapter’ lets you integrate Team Foundation Server with a wide array of ALM tools like JIRA, QC, SVN, and Salesforce. By integrating TFS with coding and testing tools, software development teams can easily collaborate on projects regardless of whether they are located within the same department or geographically distributed. In software projects, source code files change over time; new files are created and old files are deleted. Typically, several developers work from different workstations on the same and/or different files. As a result keeping track of every change can become a tedious task. A Source Code Management (SCM) system like TFS allows multiple developers to work on the same project/ project files at the same time. When Team Foundation Server is integrated into the ALM system by means of Kovair TFS Integration Adapter, TFS events like check-in and check-out are propagated to other tools. Visibility is gained into specific files and file versions that are being worked upon for a particular requirement, change request or defect. Also, work items can move bi-directionally into development and testing tools. As a result, different stakeholders can get visibility into TFS changes without having to navigate away from their preferred tool environment. In the integrated environment established by Kovair Omnibus, all the project artifacts including TFS work items can be optionally stored in a central repository that facilitates collaboration and reduces the wastage of efforts involved in transfer of information or software assets. This streamlines the development process and allows team members to deliver value rather than waste time in hand-offs between team members. Traceability is desired in any software project to ensure that the final product can be tracked back to business goals and customer requirements. End to end traceability can be achieved only when all project artifacts are linked to each other by direct or nested relations. When TFS is integrated through Kovair Omnibus, developers can link requirements and issues from other tools to code files while testers can link issues to test cases and requirements thereby creating a complete chain of traceable artifacts. It is common to have multiple versions of the same software deployed at different sites. Often, bugs are present only in certain versions. Therefore, for the purpose of locating and fixing bugs, it is imperative to keep multiple versions of the software well within the reach of the developers. TFS integration addresses this requirement and allows developers to access specific versions or latest version of code snippets from their development tools. TFS itself is intended for collaborative software development. 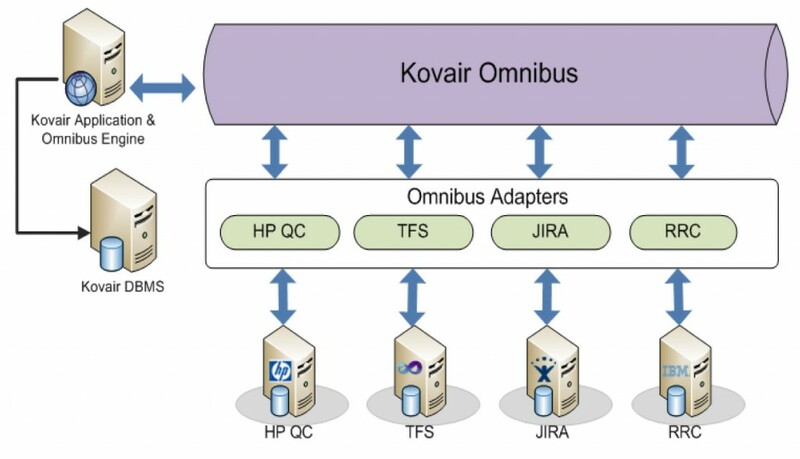 Kovair TFS Integration Adapter and Omnibus adds to the value of Team Foundation Server by bridging the gap between TFS and ALM tools that are not naturally compatible due to vendor issues or platform dependencies. TFS provides data collection and reporting features that aid in the assessment of a project’s health. Integration of TFS with other tools like JIRA and HP QC ensures that data about defects and test cases can also be utilized to generate reports and thereby provide improved visibility into the project. As shown in the above example, you can integrate TFS and JIRA so that requirements in TFS are replicated in JIRA. While creating a bug in JIRA you can link it with the appropriate requirement. The bug, along with the linked requirement is replicated in TFS. As shown in the above example, you can integrate TFS with SharePoint, QC, and JIRA so that requirements in SharePoint are replicated and linked with: source code files in TFS, test cases in QC, and defects in JIRA. Also, test cases from QC and defects from JIRA can be replicated in SharePoint. Allows you to access specific versions or the latest version of code snippets in TFS from other development tools. Allows you to manage organization-wide macro processes cutting across various tools. Helps you generate accurate cross-tool reports regarding project status with a single mouse click. Helps you get granular visibility of the valuable software assets that teams across your organization are building and maintaining from the tool of your choice.